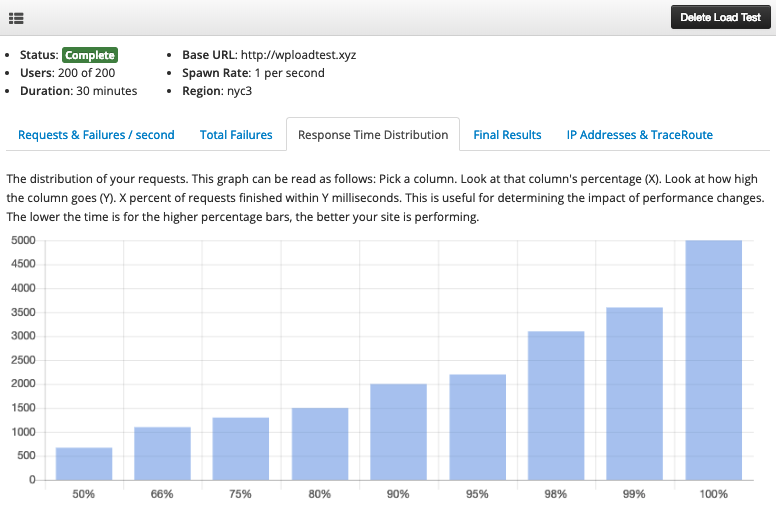 Load test your own WordPress site with Kernl! Getting started is free! In the world of cloud computing there are a lot of different options to choose from. 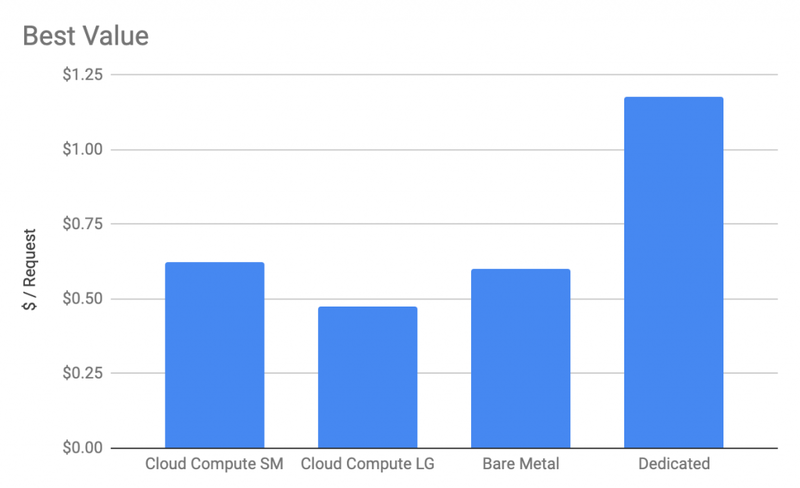 Normally you only need to choose how big your instance will be (2 vCPUs or 4, 2GB RAM or 6), but some cloud compute providers are upping their game and providing an even wider array of options and instance types for you to choose from. Cloud Compute – You get your own virtual server, but it is sharing hardware resources with lots of friends. Noisy neighbors can definitely be a problem. Dedicated – Dedicated servers, but virtualized. I (think) it is possible to run in to noisy neighbor problems in this situation. Bare Metal – Dedicated servers and hardware. No hypervisor and no noisy neighbors taking up your resources. In this article we’re going to see how a very basic WordPress install performs on the different types of Vultr compute instances. 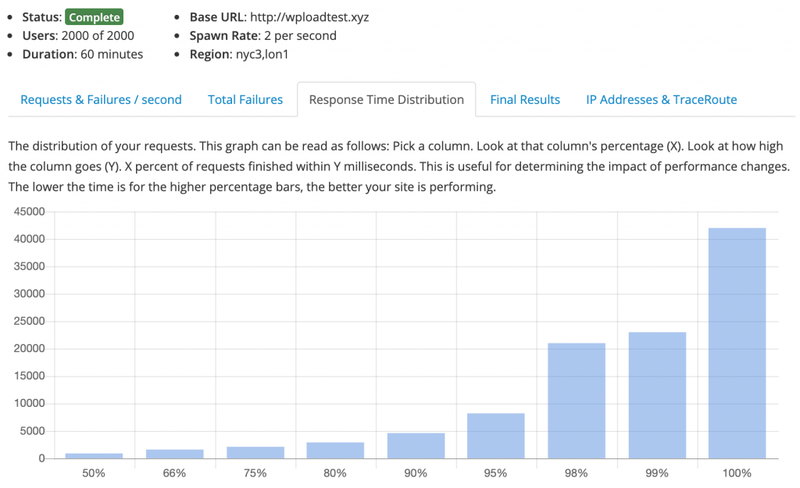 We’ll do so using Kernl’s WordPress Load Testing service. As per usual with Kernl load tests I imported this blog’s content into each load testing environment. The load test skews extremely read heavy. If you have a site that is write heavy or a mix you may see different results. Each test was performed for 1 hour with 2000 concurrent users generating load from London and New York to Vultr’s data center in New Jersey. For this test I used Vultr’s pre-built WordPress image with no caching. A lot of readers might say “But you can get much better performance using X or Y!”, and they would be right! But I’m not testing Apache vs Nginx performance, or W3 Total Cache vs WP Rocket, I’m testing Vultr hardware under load in a real world scenario. 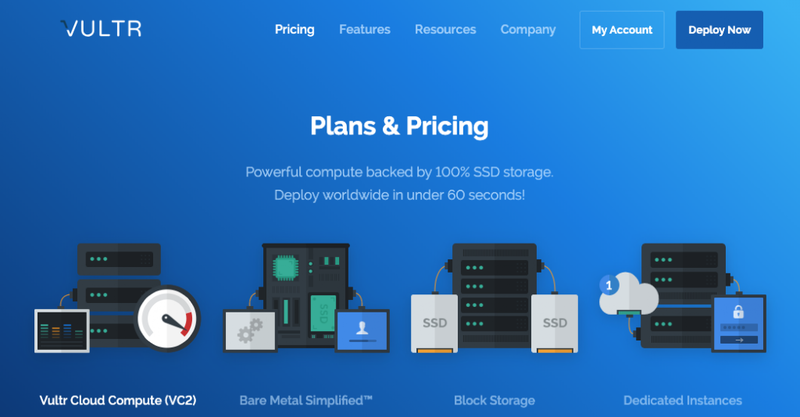 I simply want to know at the end of this article if Vultr Cloud Compute, Dedicated, or Bare Metal is better for WordPress hosting. The first test I performed was against the $10 per month Vultr Cloud Compute offering. As expected of a $10/month VPS performance wasn’t awesome, but it also wasn’t terrible. As you can see, lots of failed requests and only maintaining throughput of 16 req/s. Not unexpected with a single core and 1 GB of RAM. 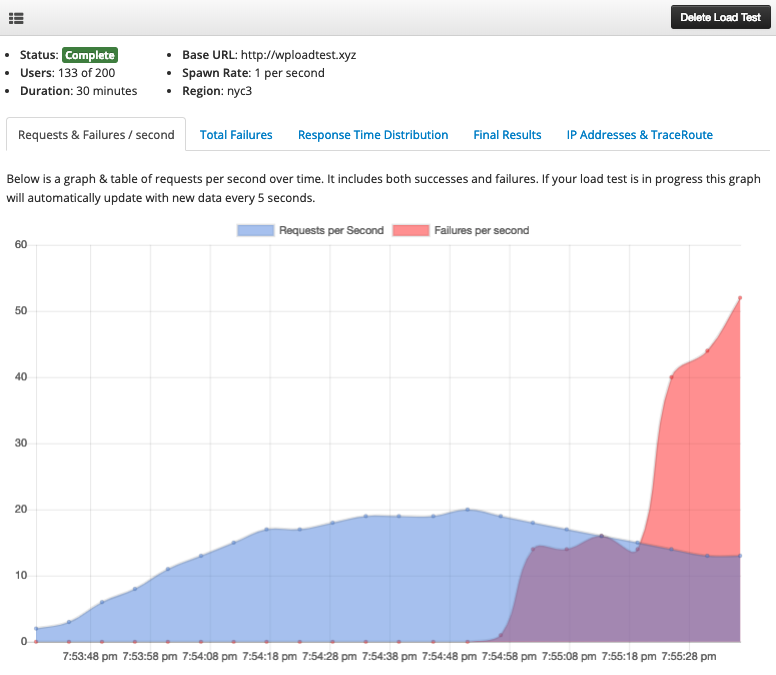 After all, I was throwing 2000 concurrent requests per second at the server. The response time distribution was similarly bad. Bad, but could be a lot worse. Overall, the results for the $10 VPS were as expected. This isn’t really an apples to apples comparison (we’ll get to that later), but I wanted to give you an idea of what basic VPS instance performance looks like. With this test we’re starting to get closer to the cost of bare metal and dedicated instances. This server had 6 CPUs and 16GB of RAM. Considerably more robust than the $10 server. Lots of red, but also blue!!! This graph tells a much different story than the previous test. Performance peaked at 169 req/s and then leveled off at 100 req/s. We still saw a lot of errors, but once again this isn’t unexpected. Honestly if you started to get this much traffic you would likely start breaking up WordPress into its components (file system, PHP + Nginx, MySQL) and start scaling horizontally. 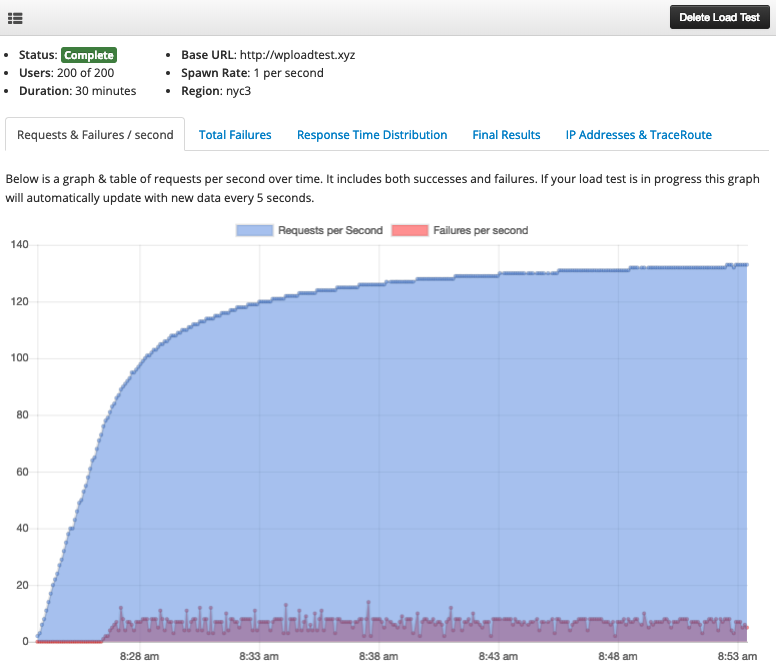 The response time distribution was much better for this server as well. The upper end was just as bad as the cheaper box, but the 90% and below ranges were pretty solid for the amount of traffic that was being received. 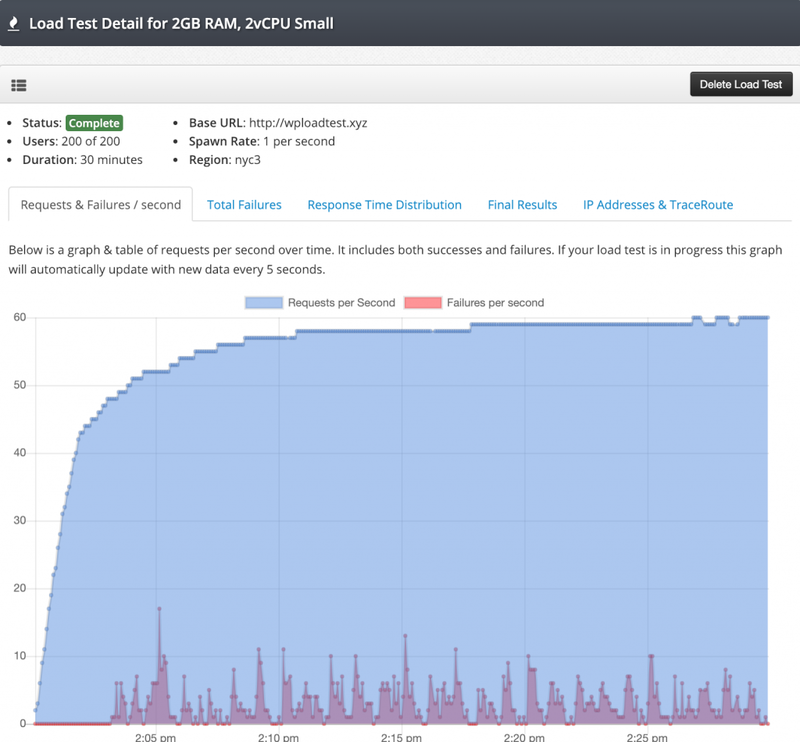 The Vultr Bare Metal server was the instance I was most excited about testing. I’ve always had a soft spot for hardware and getting access to a bare metal server is pretty cool. For $120 per month (on sale, price will rise to $300/month eventually) you get 8 CPUs and 32GB of RAM. This is a pretty serious server. Lots of blue on this graph but also the expected amount of red. You can see that throwing 2 more non-virtual CPUs and 2X the RAM made a pretty big difference. We peaked at 200 req/s and then leveled out at 125 req/s. For reference that is 17.2 million requests per day. The lower end of the response time distribution was solid, but the upper end wasn’t great at all. With all of those errors it isn’t surprising that this is the case. I honestly had a tough time figuring out why Vultr priced the bare metal and dedicated instances so close to each other. Dedicated is clearly inferior (far fewer CPUs and RAM) so why would anyone choose it? Anyway, let’s take a look at the graph. This test peaked at 100 req/s and then leveled off at around 70. I really would expect a lot better performance for this sort of money. Also 💩, but not as much 💩. Response time distribution was similar to the other boxes. With all the failures it tends to skew pretty hard in the wrong direction. I’m sure that there is a use case for these dedicated Vultr instances, but it definitely isn’t hosting a WordPress site. With all of this data it was pretty easy to graph which of these is the best value. Value was calculated by taking the cost per month and dividing it by the maximum number of requests. Based on the performance we saw above the Vultr Cloud Compute instances seem like your best value for WordPress hosting. 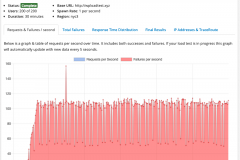 For WordPress hosting it looks like Vultr Bare Metal and Dedicated instances aren’t a great choice. As mentioned above, there are likely use cases where they are a good choice though (maybe workloads that require very consistent performance). As with all of these tests, your mileage may vary! I highly recommend that you run load tests on any new host that you use to get an idea of what sort of performance you can expect. March was a great month for Kernl! We did some blogging, a bunch of infrastructure work, and a little bit of unplanned work due to API deprecation at BitBucket. Resource Starvation (Load Testing) – We’ve decreased the number of users per machine that Kernl WordPress Load Testing uses. This helps prevent resource starvation on the load generation servers. Pre-Configured Load Tests – Kernl now has 4 different pre-configured load tests to make testing your site’s performance even easier! BitBucket API Update – BitBucket API calls now use Oauth2 and their v2 endpoints. The v1 endpoints are going away in April. Analytics – All of the features available in Kernl Analytics Agency plan have been rolled into one single plan at the same $10/month price point as the small plan. We also increased data retention to 365 days to make our comparison tool more useful. 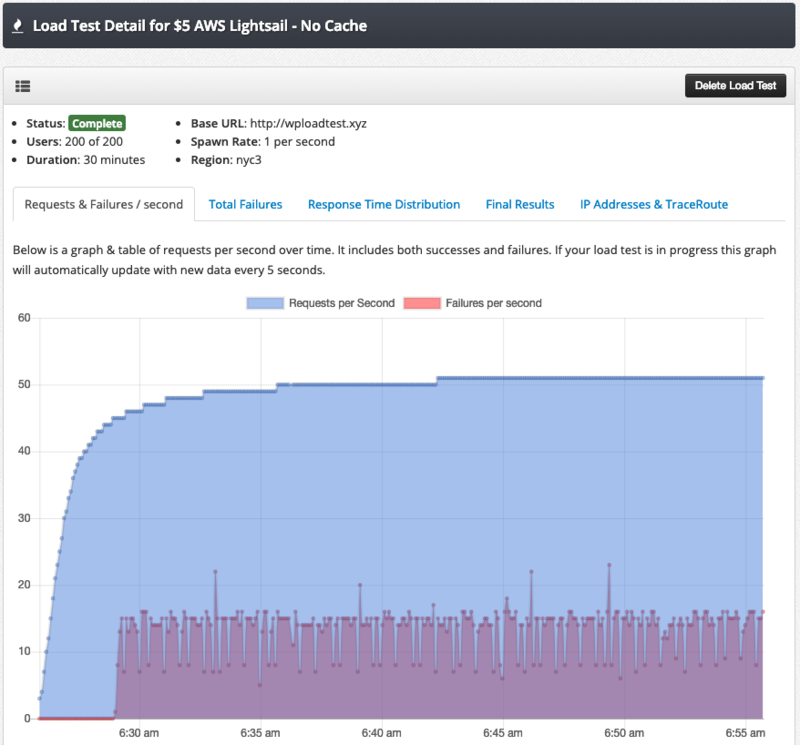 Load Test Working Indicator – Load tests will now show a “working” indicator when in a state before the load test has started but after you have submitted your request to start a load test. MongoDb Driver – The MongoDB driver that we use has been upgraded for better connection retry handling. 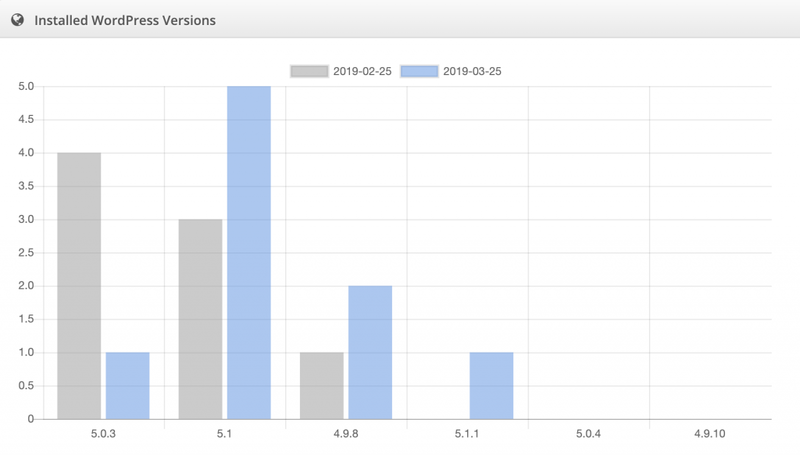 Updates – Kernl Analytics and Kernl WordPress Load Testing have been upgraded to Node.js 10.15.3 and have had all of their packages updated. License Management Widget – The license management widget was throwing an error when no error was present. This has been resolved. A ‘small’ plan with simple daily analytics and 24 hours of data retention. A ‘agency’ plan with data comparison and 90 day data retention. Data comparison between dates. This allows you to see trends with your plugin or theme usage. Data retention of 1 year. Long data retention gives you the ability to see trends that might not be obvious with shorter retention periods. 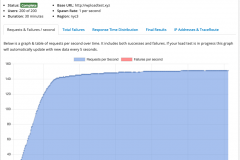 Posted on March 26, 2019 March 26, 2019 Author jackCategories Kernl, Wordpress DevelopmentTags digital ocean, kernl, load test1 Comment on Is More RAM or More CPU Better for WordPress Hosting? Want to load test your own WordPress site? Sign up for Kernl now! In the world of affordable WordPress hosting there is an array of different VPS providers to choose from. With so many choices how do you know who to choose? In addition to criteria such as ease of use and support, performance is a huge concern for most people deploying WordPress. 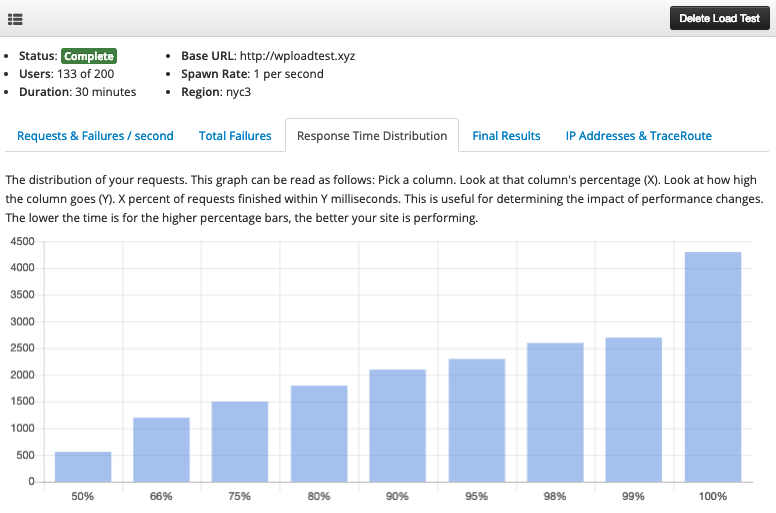 In this article we’ll take a look at the performance of several different VPS providers in the $5 tier to see how they perform under load by using Kern’s WordPress Load Testing feature. What tests will we run? 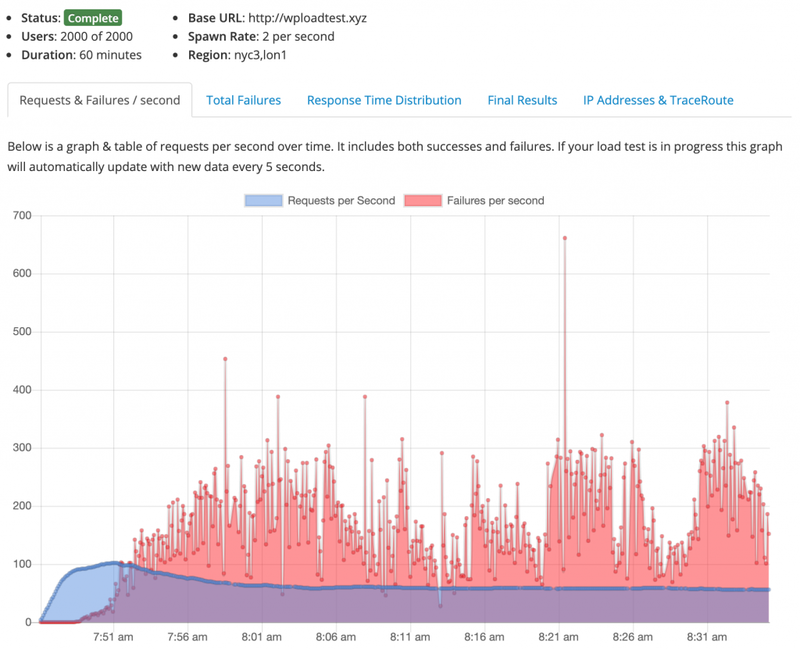 No Cache – 200 concurrent users for 30 minutes. 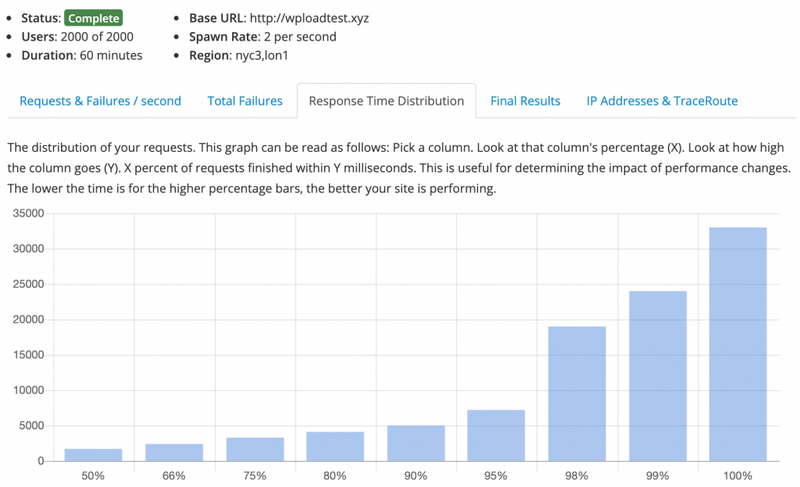 We used this test to see raw WordPress performance with no caching enabled. 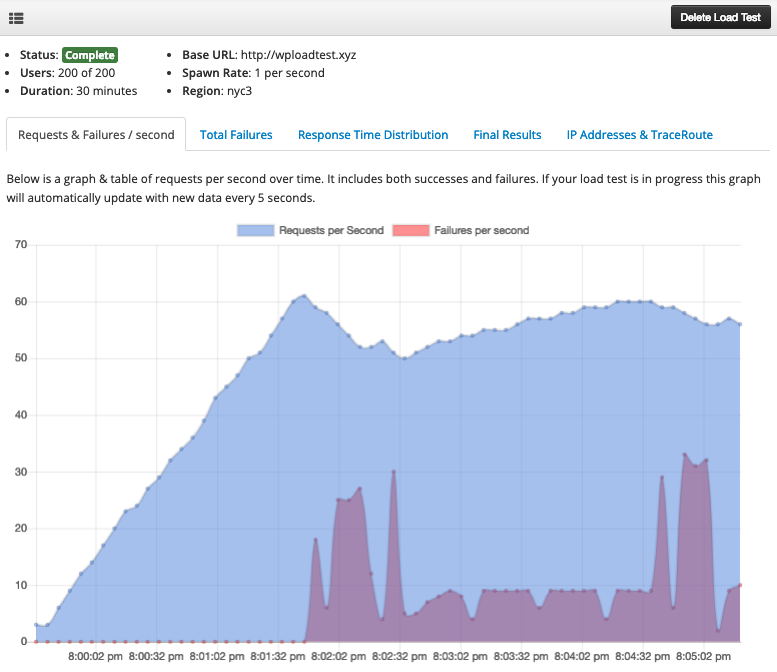 Cached with W3 Total Cache + Memcached – 200 concurrent users for 30 minutes. We used this test to see what a more real-world scenario looks like. In general most people use some form of caching on their site. With regards to regions, for every test we kept the VPS instances on the east coast of the United States with the exception of Hetzer where we had the VPS instance in Germany. First, let’s take a look at the request / second results across the different providers. As you can see there is a wide spread of results depending on host. Honestly this wasn’t want I expected when I started. You’ll also notice that the Azure box cost $15/month. It was the closest I could get to finding a $5/month box in their interface (which I felt like I needed another degree in Computer Science to understand!). So let’s visualize the data with no caching enabled. 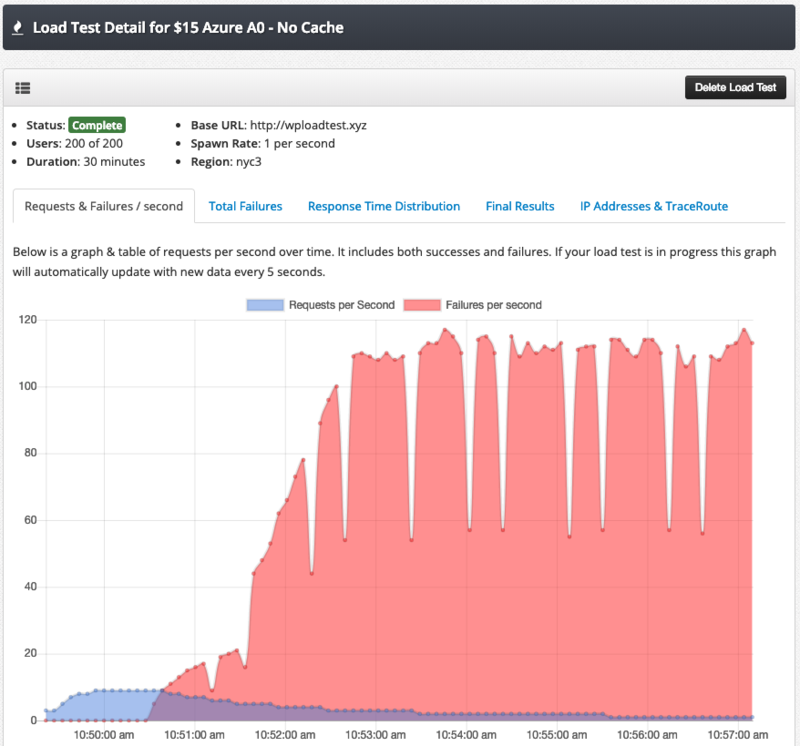 Google Cloud and Azure performed TERRIBLE. I’m not sure why. Maybe it had to do with accessing the disk so frequently to load up PHP files? (but I expect that those were cached by PHP FPM or some other underlying process). If you are in Europe, Hetzner is your friend. $5/month gets you 4x the ram and 2x the vCPUs are the next closest provider. If you are in the US, AWS seems to be winning in this test but not by much. It feels like you would be fine going with Digital Ocean or Vultr. Before making any real decisions on a host, I’d want to run 5 or so tests across different instances to make sure that there isn’t a lot of variance in my results. Noisy neighbors can often be a problem on VPS providers. Now let’s take a look at a more realistic scenario where you have a caching plugin installed. Once again, Google Cloud and Azure perform the worst out of any of these hosts. Given how highly regarded they are in the hosting ecosystem outside of WordPress I expected better performance. All of the other providers posted impressive numbers (170 req/s – 180 req/s). At level I would probably choose whatever provider had the best support, user interface, and reliability. I suspect that most of these boxes could handle a little bit more load before going under. If I increased this test by an order of magnitude (200 users to 2000 users) I think most of the providers would tap out before Hetzner does due to how much more RAM and CPU it has. 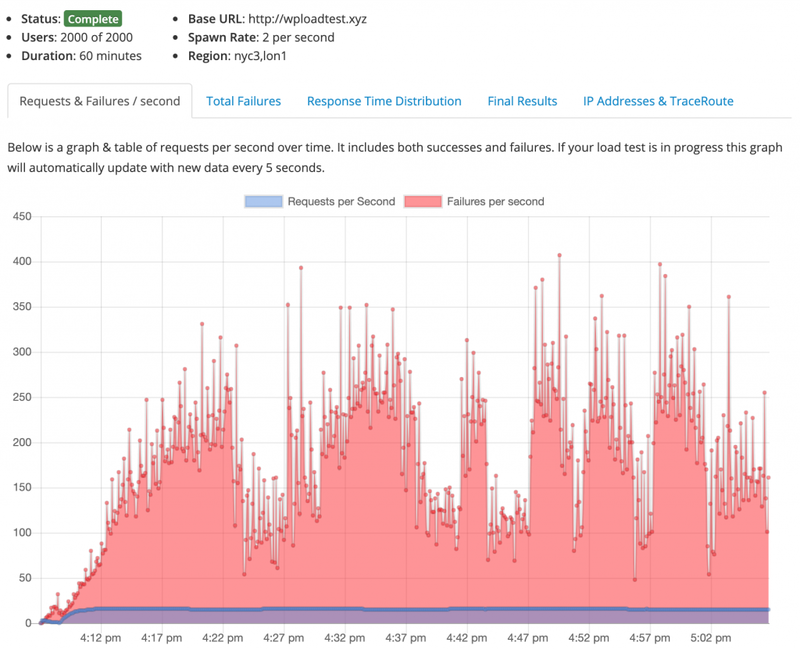 While requests per second and failures per second are valuable metrics, in order to get a more holistic view of raw performance for these $5 VPS instances we need to look at response time distribution. So how should you interpret this chart? For the percentage columns, each value is in milliseconds. 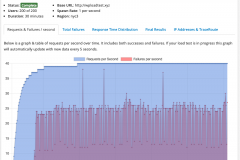 If you look at the 99% column, you can see that 99% of Vultr requests returned in <= 3600ms. If you look at the 80% column for Vultr, you can see that 80% of Vultr requests returned in <= 3400ms. Let’s take a look at our un-cached results. Any service that hit the 5000ms mark killed the request. I think that they likely would have gone far beyond that. Once again, for $5 Hetzner is just crushing it. You simple can’t compete with 4GB RAM and 2vCPUs. 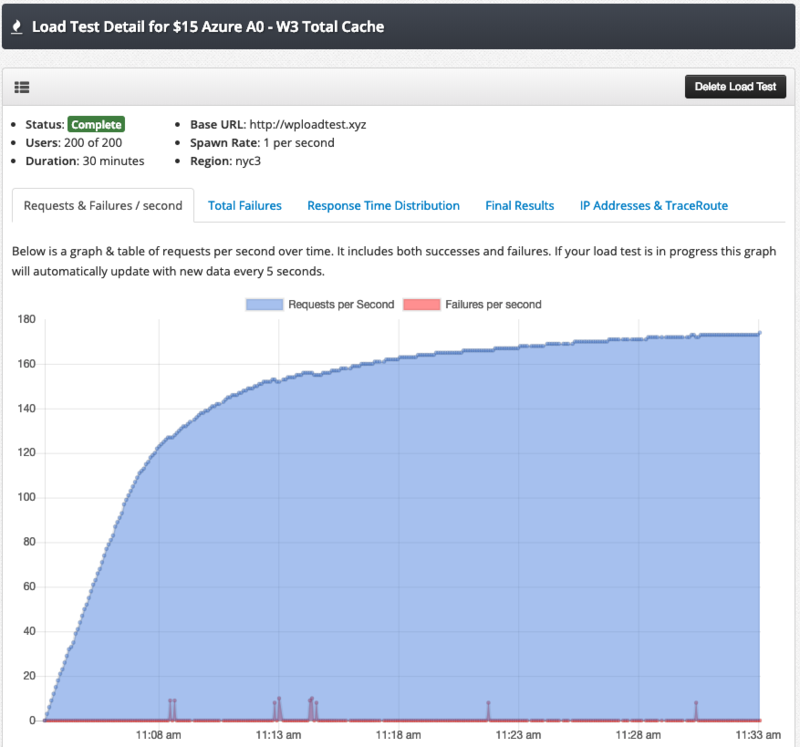 Even with no caching their 99th percentile was under 2 seconds! 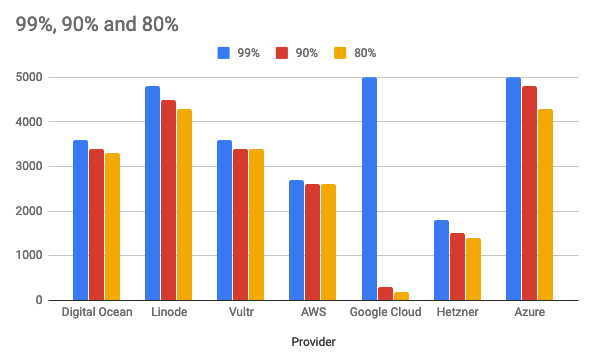 For our non-european readers, Digital Ocean, Vultr, and AWS seemed to perform the best. 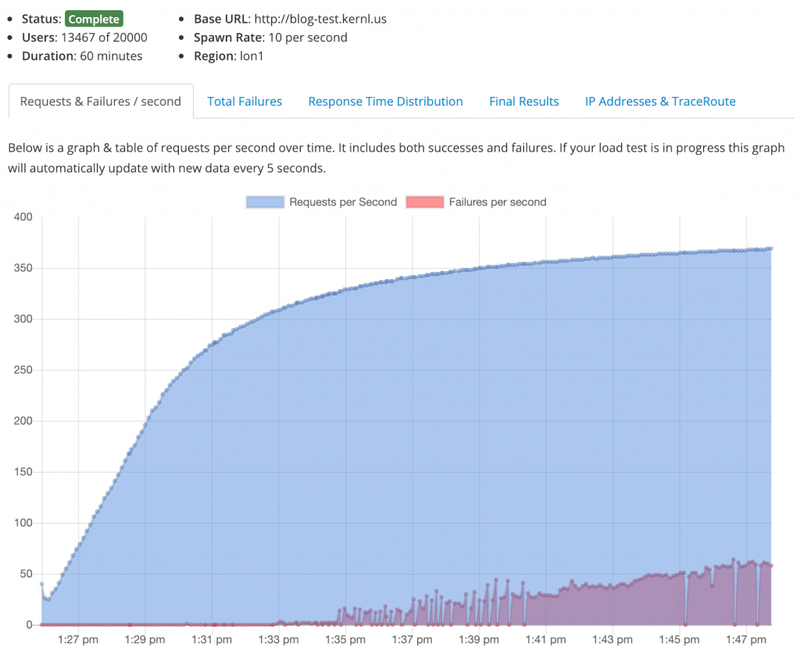 AWS remained remarkably consistent across the response time distribution range. This is a good thing. Google Cloud… wtf? So 99% of your requests finished in <= 5 seconds, and then 90% of requests finished in <= 300ms? Something is fishy. And now, let’s see how things change when caching is used. 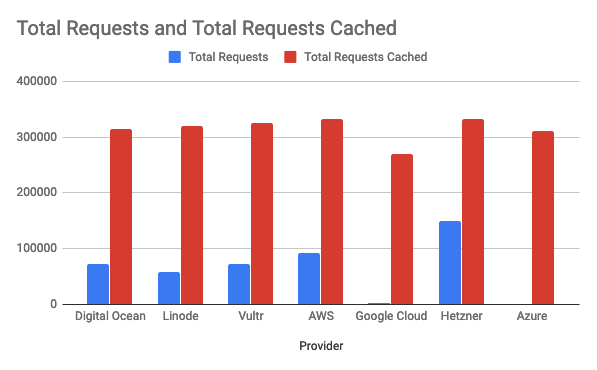 As expected, most providers do very well when caching is used. 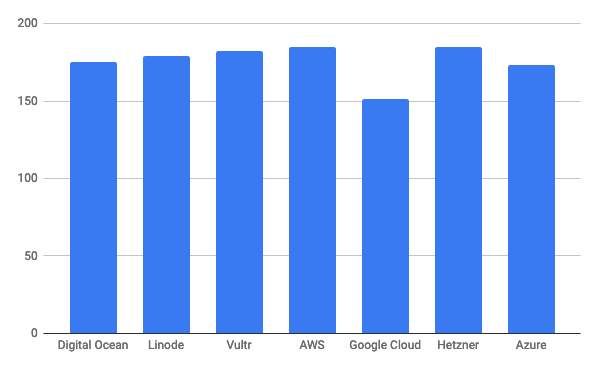 Digital Ocean, Linode, Vultr, AWS, and Hetzner are all performing in the <= 200ms range (some lower!). It’s hard to decide who is better at this level due to latency due to geographic distance. The point is that you could choose any of those hosts and be OK when using a cache plugin. Once again, I’m struggling to figure out why someone would spend their $5 on Azure or Google Cloud. 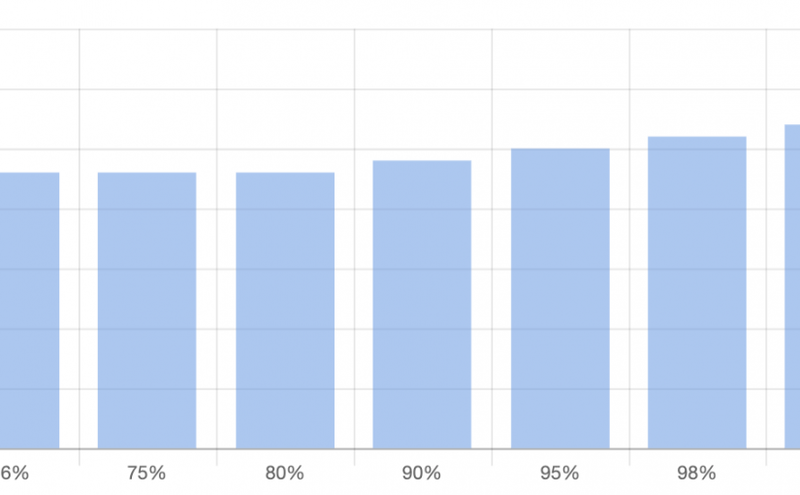 Our final metric we need to look at before we can pass any judgement on our VPS providers is total requests. This in particular needs to be compared with response time distribution. I’m 90% positive that the Google Cloud and Azure instances nearly stopped processing requests at some point. They were so overwhelmed that they just fell over. The data seems to support this. Google Cloud and Azure are not the best place to spend $5. Even with caching I would be scared if there was ever a cache-miss. 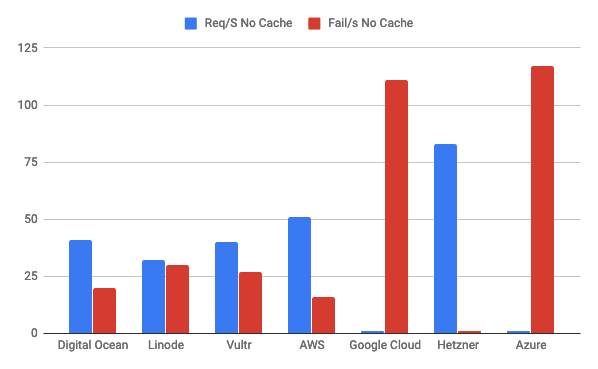 Hetzner is the clear winner in un-cached data. Once again, this makes sense how much more machine you are getting for your money. On the U.S. side of the ocean, AWS seems to win here, although not by much over Digital Ocean and Vultr. 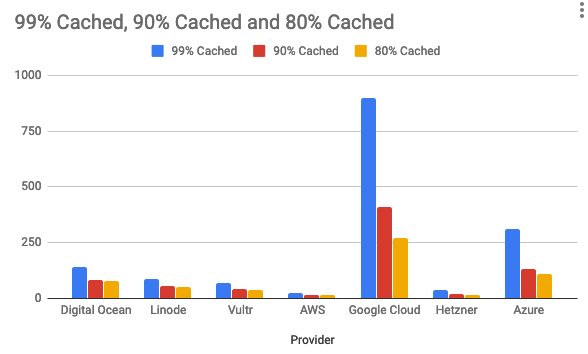 Once caching is taken into consideration they all perform roughly the same (accounting for latency between data centers and load generators). If performance is all you care about for your $5 (and thats a big if), then choose Hetzner if you need a VPS in Europe. If you need a VPS in the US or elsewhere, choose AWS, Digital Ocean, or Vultr. Microsoft and Google are not great for $5. February was a pretty busy month for Kernl! 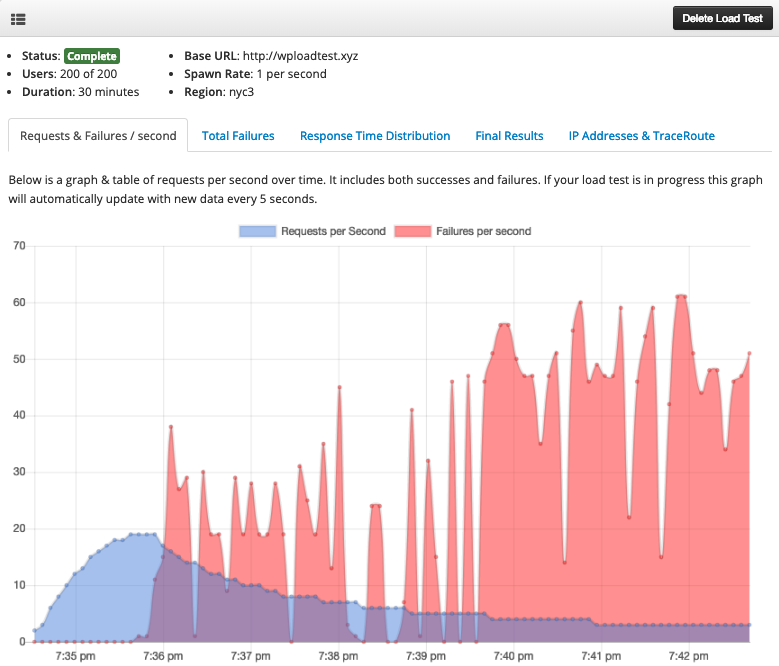 We had a lot of great tweaks to load testing, a few customer feature improvements, and some infrastructure work. Lets get started! 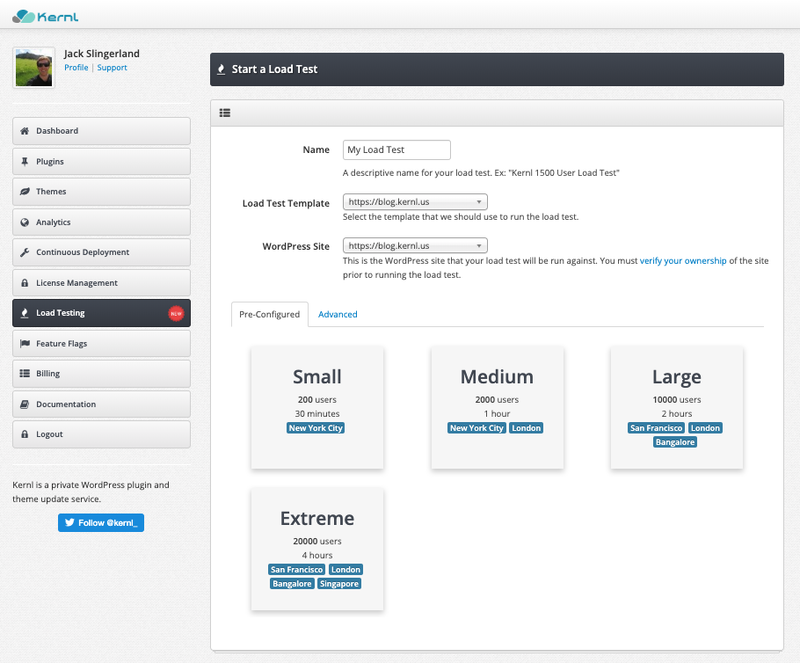 Multi-Region Load Tests – You can now select multiple regions for your WordPress load tests! Instead of having all traffic come from a single region you can have it evenly distributed across all the available regions. This is useful for testing if you have a global audience. 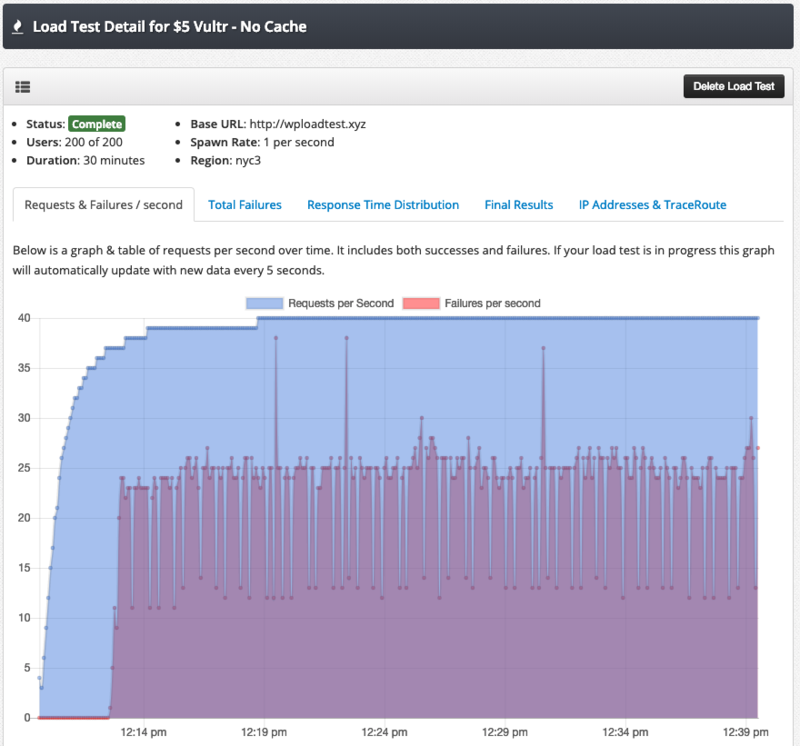 Load Testing Enters General Availability – Kernl’s WordPress load testing is now available for all customers. Delete Load Tests – You are now able to delete your load tests. License Max Version Bug – A customer brought to our attention that the “max_version” field behavior wasn’t quite right. This has been resolved. Multiple License Domains – If you use our license management system and restrict via domains, you can now enter multiple domains on a per-license basis. This is useful if you want to use the same license for local, staging, and production. License Management UI Updates – We’ve simplified the list view in license management by removing some columns that were cluttering the screen. We’ve also lined up the action buttons better and will now notify you in the plugin/theme detail pages if you have license management enabled but no licenses associated with your product. The Kernl Analytics server was re-sized to be smaller. It was way over allocated. 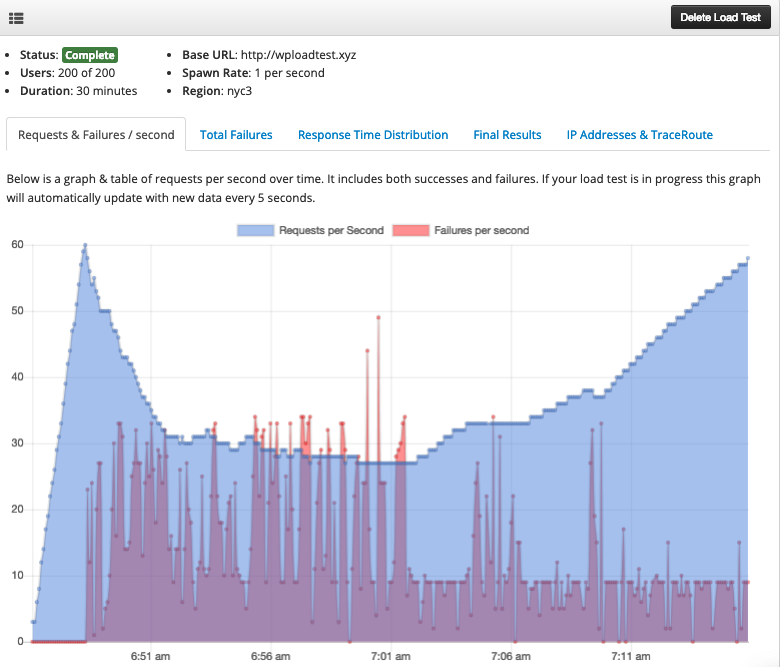 Load testing was moved to a Kernl sub-domain. Prior to this it had a top-level domain. 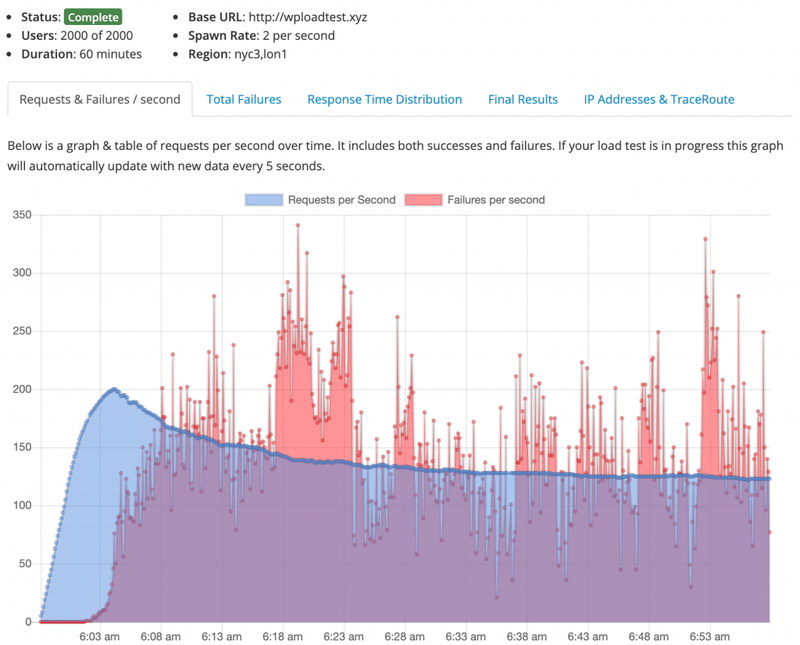 Load testing servers that don’t come up after 3 minutes are removed from the load testing pool. Session handling (for OAuth) has been moved to cookies. Prior to this we stored sessions in Redis. We have removed our dependency on the ‘Q’ promise package on the Node.js app servers. 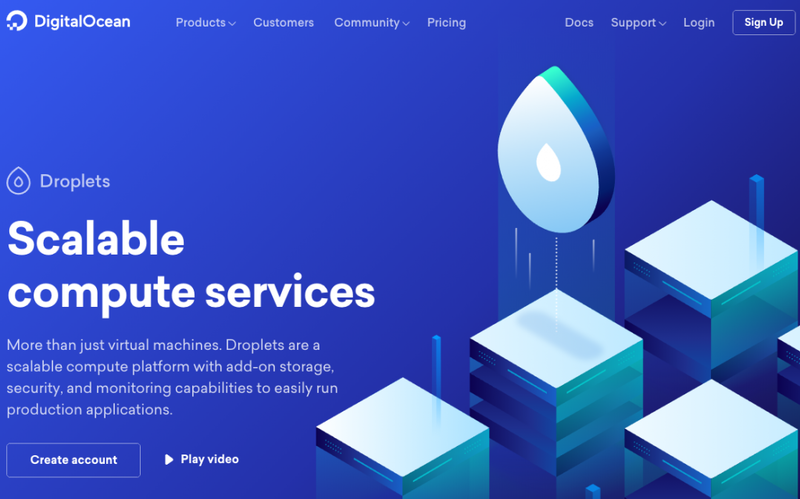 Measuring the Performance of WordPress on Different Digital Ocean Droplet Levels – In this blog post we load tested lots of different Digital Ocean droplets to see what the best “bang for your buck” is. Thats it for this month! 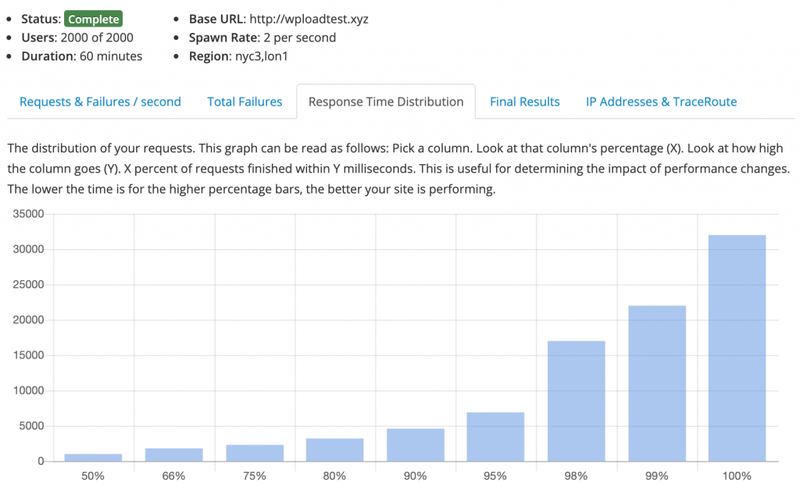 Earlier this year Kernl launched our WordPress Load Testing offering. 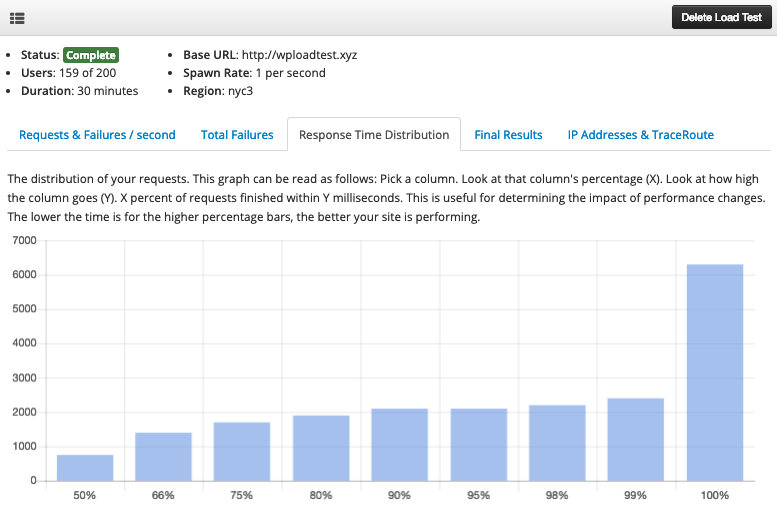 Prior to the launch we had been doing a series of blog posts testing the performance of “managed” WordPress providers. In this blog post I’ll test the performance of Digital Ocean’s VPS solutions with a standard LEMP (Linux Nginx MySQL PHP-FPM) installation by scaling it vertically. 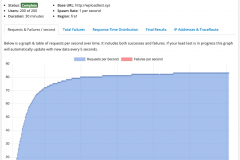 Want to measure your own WordPress performance under heavy load? Sign up for Kernl. The Digital Ocean 1-click LEMP install is already configured to take full advantage of as many cores and as much RAM as is available. During the course of these tests I never needed to tweak any server settings. 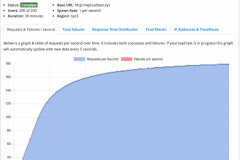 That doesn’t mean that more performance couldn’t have been extracted through configuration tweaks, but even with these settings we were able to gain useful information about WordPress performance on the different Digital Ocean droplet levels. With regards to WordPress configuration… there isn’t any. No caching, CDNs, or compression. Just raw WordPress. 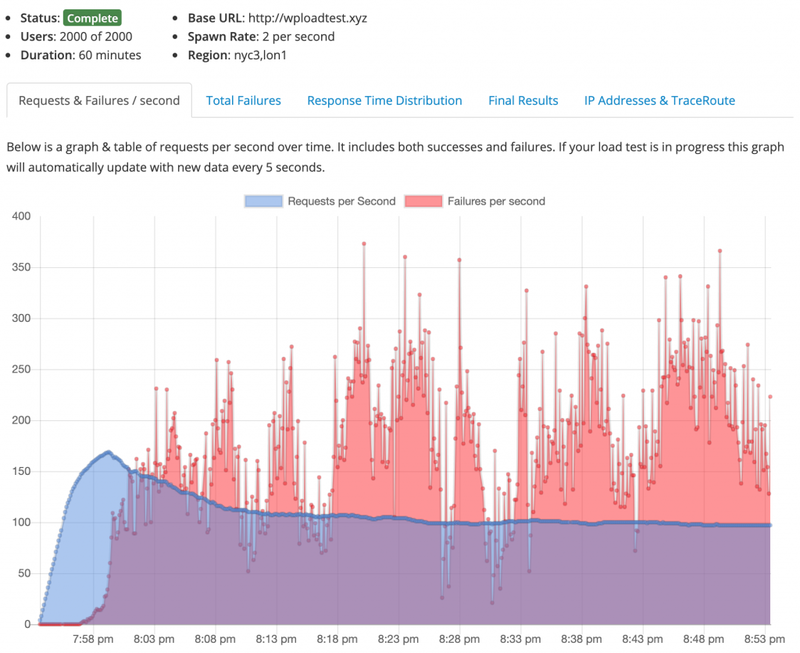 Its easy to get high performance out of WordPress if you cache everything, but seeing what performance looks like in the worst-case scenario is far more interesting. For this series of tests I imported the contents of my personal blog (Re-cycledair) to the target and then used Kernl to run the load tests. Due to the nature of my blog this test is very read heavy. While this isn’t realistic for everyone, for my personal blog the test is representative of the actual traffic that it receives. As expected the amount of traffic that we could handle scaled linearly with the amount of hardware we were using (and cost). One interesting thing you’ll see in the graph is that in two places the requests per second actually trend down. Looking at the data above you can see that I tried Digital Ocean’s standard droplets as well as their CPU optimized droplets. The difference between them is cost and dedicated hyper-threads. From a cost perspective, you’re better off going with the standard droplet in the same price category. Personally I expected the CPU optimized droplet to perform better, but this might not be the best type of workload for it. Just for fun I tried out the one-click install of WordPress with LiteSpeed configured on a $5 / month droplet. 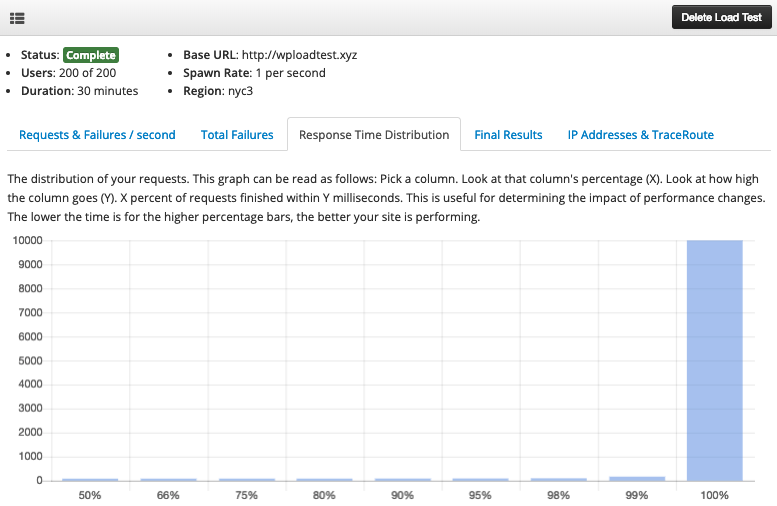 The @digitalocean one-click application for #WordPress w/ #LightSpeed is pretty amazing. 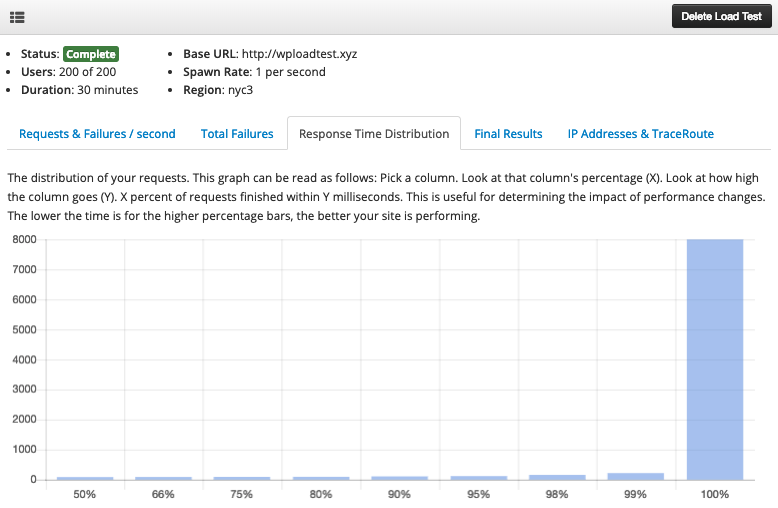 On a $5 / month droplet I'm getting almost 1000 req / s with a pretty nice response time distribution using @kernl_'s WordPress load testing tool. Things went really really really well. Thats right. By the time the test was completed my little $5 / month droplet was receiving 1800 requests / second WITH NO ERRORS. For perspective, thats 4.6 billion requests per month. The data does a good job speaking for itself here, but in general you should definitely stick to Digital Ocean’s standard droplets when running WordPress. 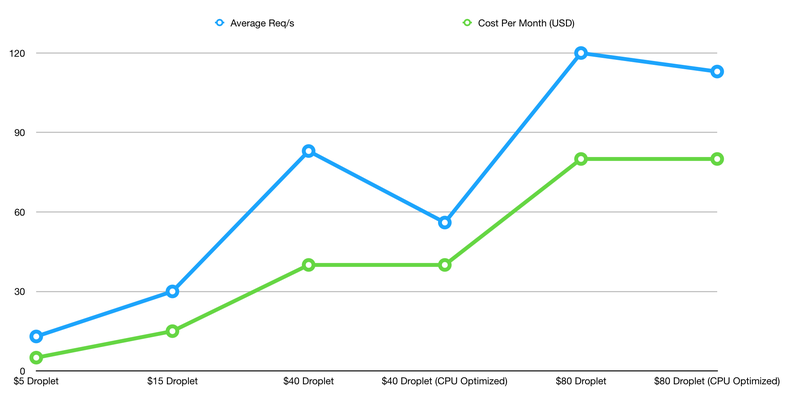 Even without caching you can get really good performance out of the $40/month droplet. 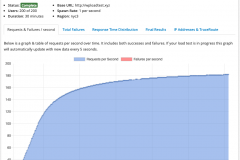 In November 2018 Kernl launched the closed beta of our new WordPress load testing service. 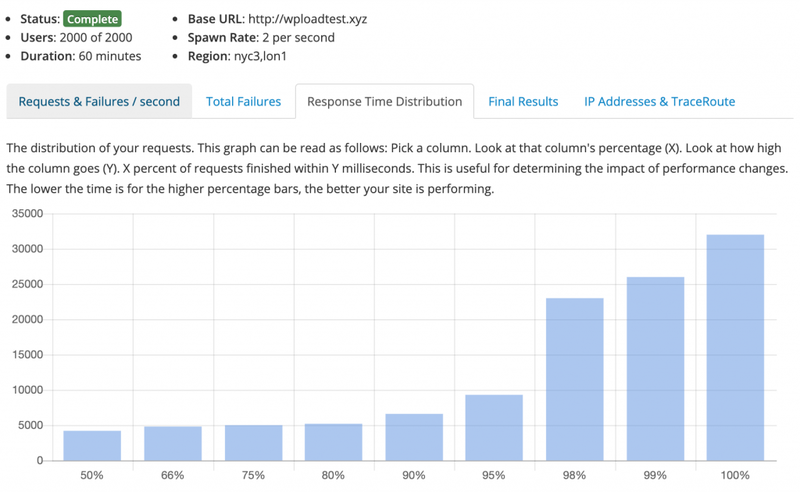 After a lot of changes based on the feedback we received we’re finally bringing WordPress Load Testing out of beta and into general availability. 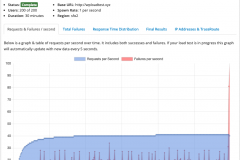 There are a lot of different reasons to load test. 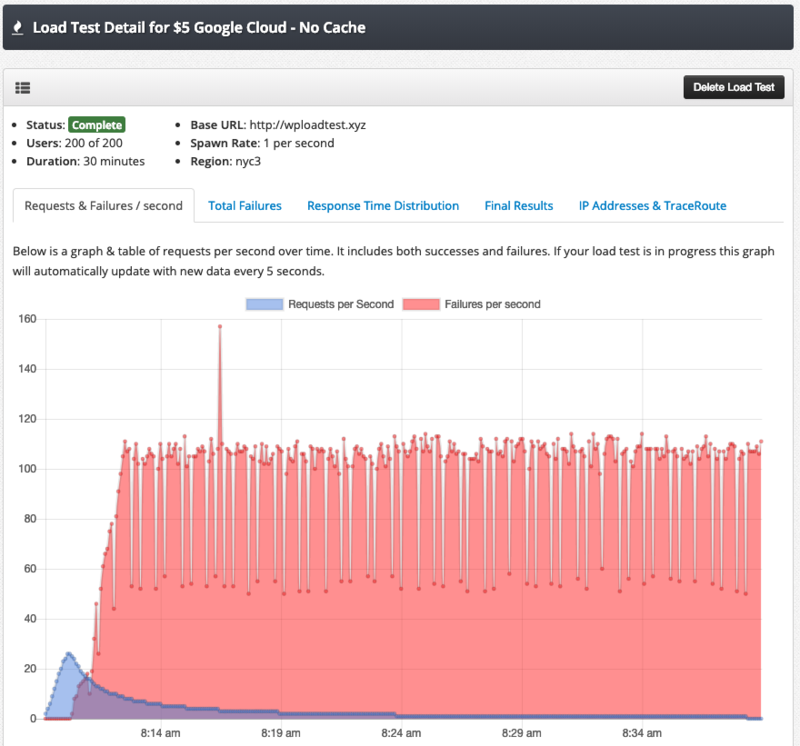 Infrastructure and Hosting – Kernl WordPress load testing gives you confidence that you are making the right decisions with your infrastructure and hosting. Looking to change hosts but aren’t sure how big or expensive of a plan you need? Run a load test. 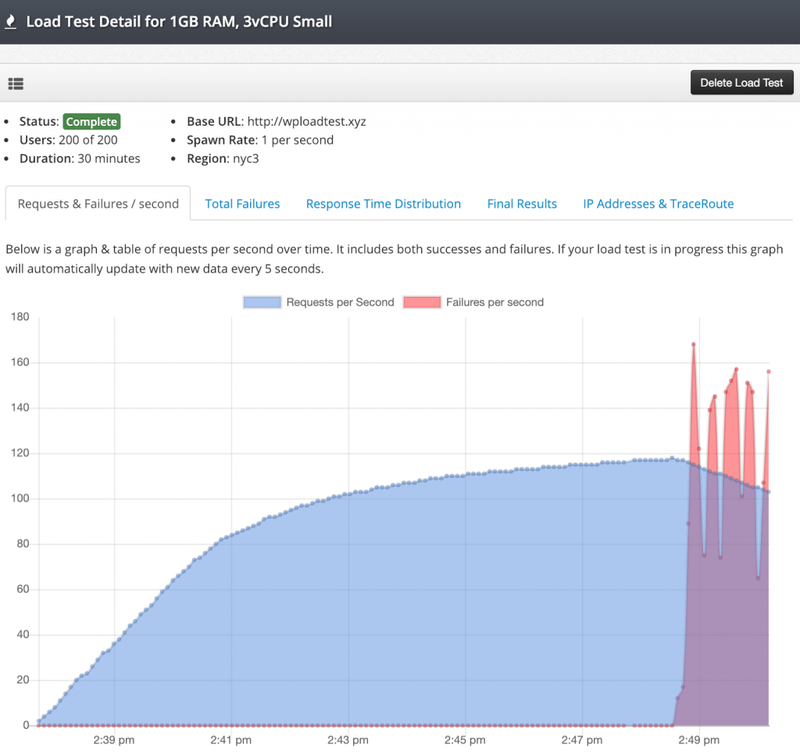 Performance Testing – Load testing gives you confidence that the SQL query you just wrote isn’t going to collapse your website under load. 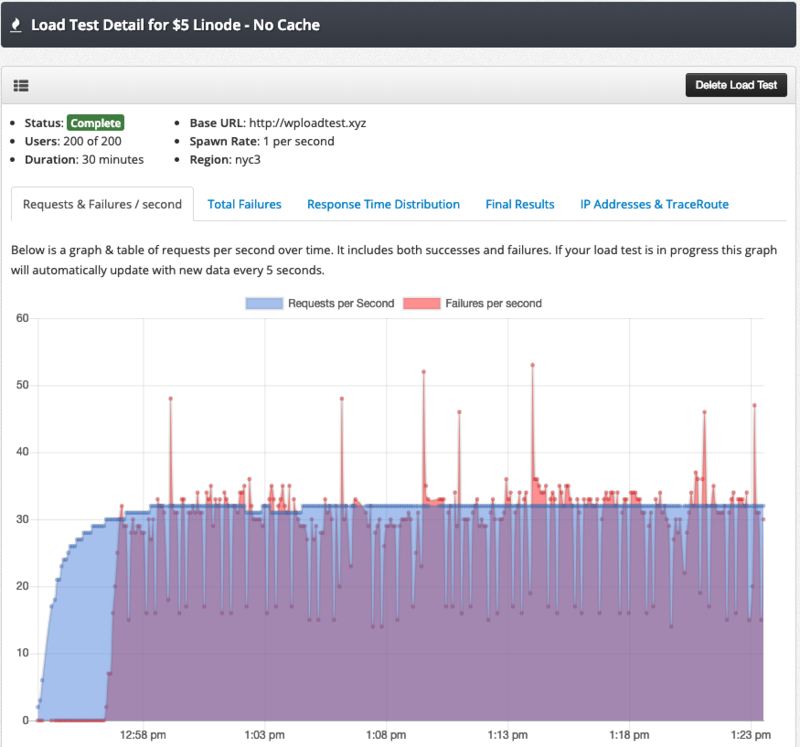 Confidence with your clients – Load testing lets you tell your clients with confidence that their new website can handle 100,000 visitors a day without any degradation in response time. 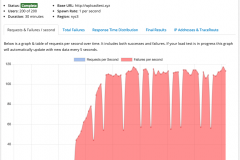 Kernl’s WordPress Load Testing solution makes load testing your WordPress site a breeze. You only need verify your ownership of the site with an easy to use WordPress plugin and then start testing. No coding or infrastructure management needed. If your needs don’t fit neatly into one of these categories feel free to reach out. We’d be happy to create a custom plan to suit your needs. 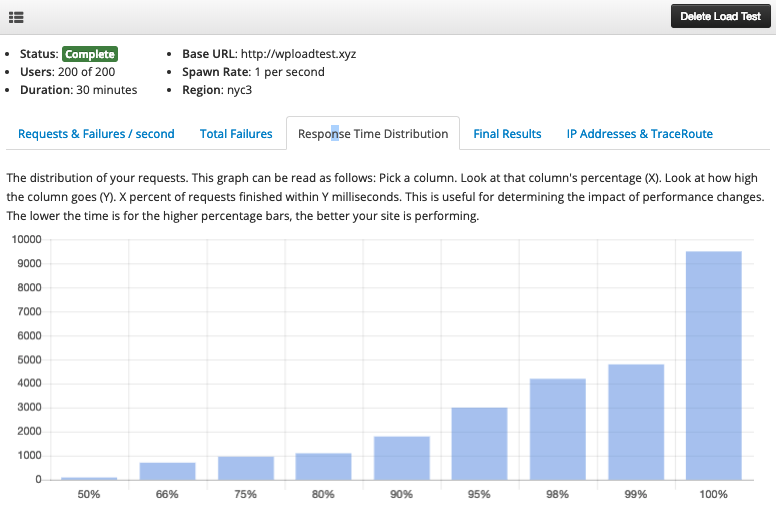 To get started with easy WordPress load testing, sign up for Kernl . Welcome to the new year! January was a great month for Kernl with lots of great new features, tweaks, and bug fixes to make your experience even better. Lets dive in. Plugin & Theme Tile View – The original Kernl list views for both plugins and themes was a table. Over time this table became difficult to understand and didn’t convey a lot of information. The new tile views shows more information about your plugin and theme while being a lot friendlier to new users. Code Widget – On the plugin and theme detail pages there is not a widget at the top that shows you the code you need to integrate Kernl with your product. This is part of a broader plan to make Kernl more friendly to first-time users. Version Table Actions – The plugin/theme version table had 5 different action buttons on it. This was super overwhelming to people so it has been collapsed into a drop-down menu instead. http://status.kernl.us – We now have a full-featured status page powered by Pingdom. You can use this site to check the health of our service. GitLab Oauth – GitLab authentication used to be powered by authentication tokens that you generated on GitLab and then copied into our system. You can now Oauth with GitLab which is a much easier flow for customers to manage. Feature Flag Wizard – Feature flags can be a little daunting if you aren’t already familiar with them. To make it easier for customers to get started with we created a feature flag wizard. If you don’t already have any feature flags I encourage you to check it out. 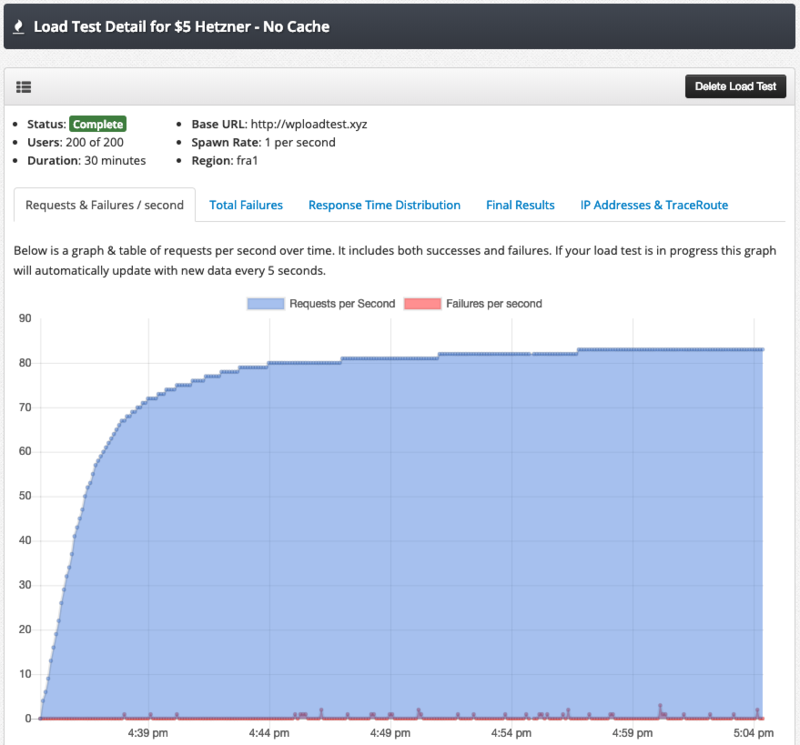 Load Test Site Verification – You are now required to verify site ownership before running load tests. This is accomplished via a simple WordPress plugin. WordPress load testing is still in closed beta, but please reply to this email if you would like to take part in testing. Unsubscribe links were broken when we whitelisted our domain with SendGrid. This has been resolved. Our application servers were upgraded to Node.js 10.15.0. 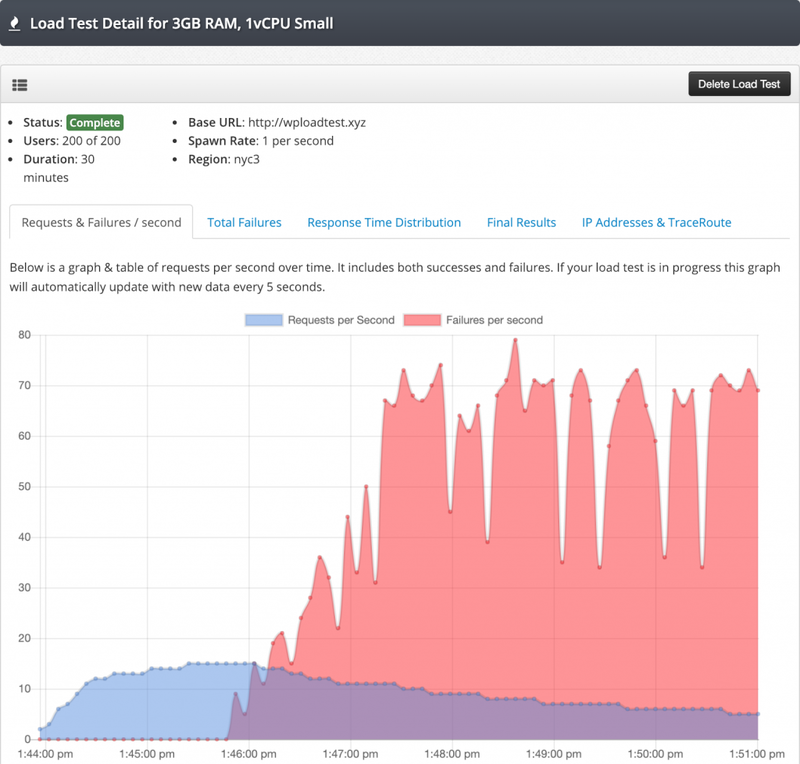 Available RAM was increased from 1GB to 2GB on our application servers. A loading spinner has been added when plugins and themes are loading. 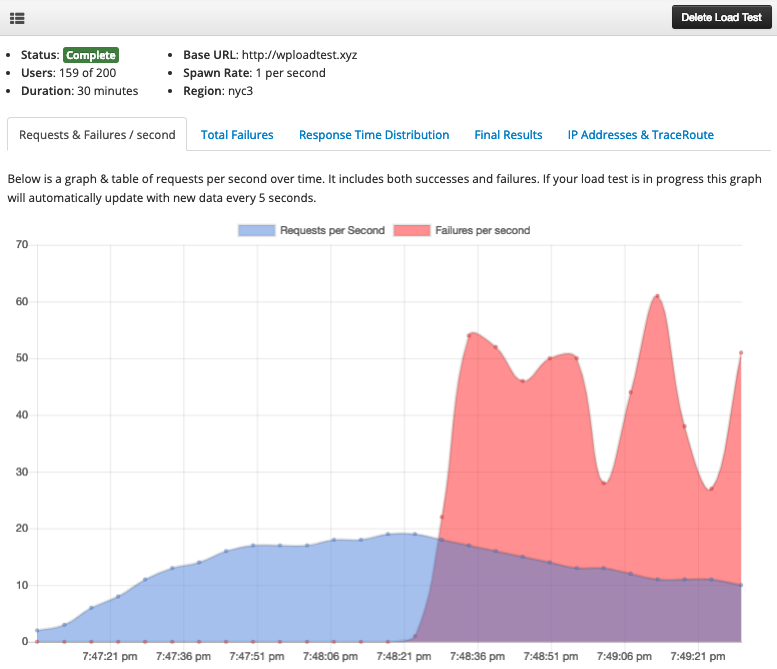 Load testing response time distribution is now blue instead of grey.